Cold bedroom? Thin doona? 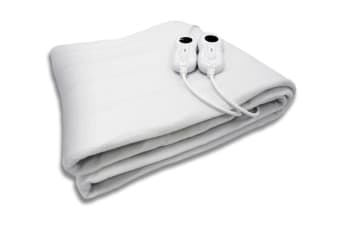 The Dimplex Fitted Electric blanket is your ticket to a warm and cosy slumber when the temperature starts to drop. Don’t wake up during the night because you’re cold! Sink into luxurious warmth for a restful, undisturbed sleep with the Dimplex Fitted Electric Blanket. The 12 hour timer and double overheat protection mean you can set and forget – the blanket will turn itself off soon after you drift away, keeping you at a cosy, comfortable temperature all night.